We introduced these two new designs by Sandra Baker Hinton at the TNNA show in Long Beach. 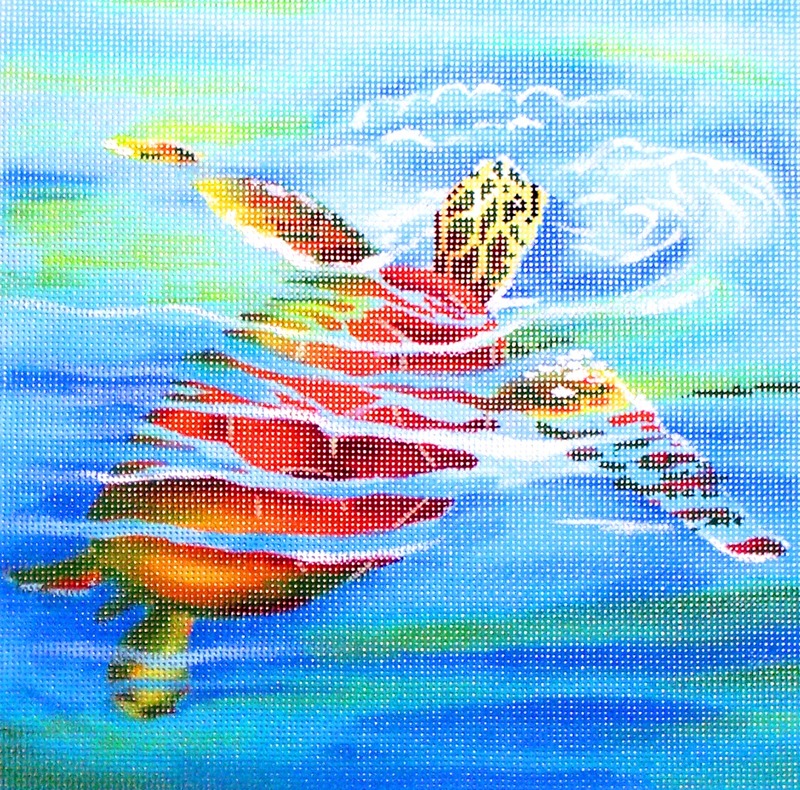 The turtle is surfacing for air and is called Exhale. The butterflies are from her yard and called Butterfly Garden. Your local shop can order these or you can contact us for a retailer. 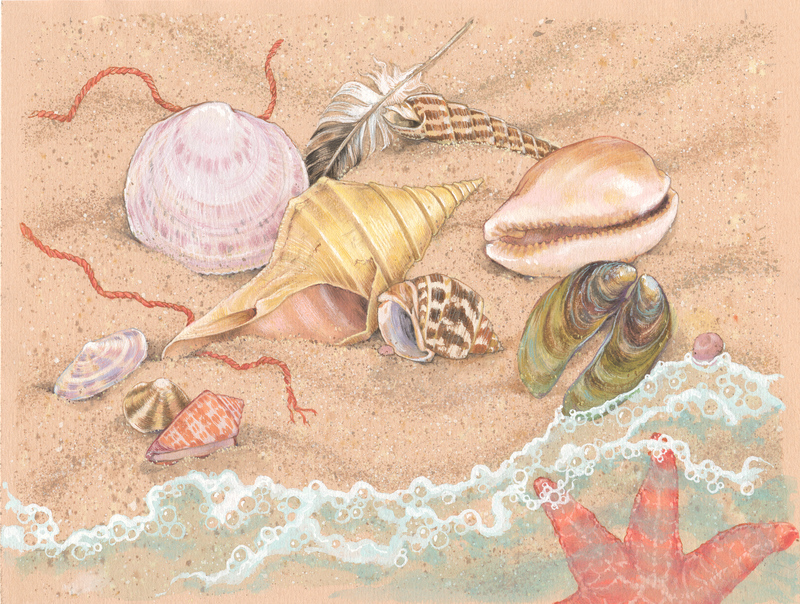 We just received a companion piece to the prior beach scene by Donna. The new design is PW1005 and it is 10×14 18 mesh. It matches PW1004 released earlier. For more information, please see our web site or send us an email. 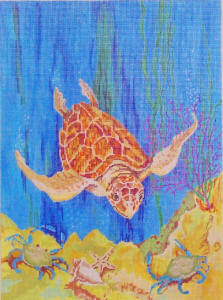 The turtle designs from Sandra Baker-Hinton are (finally) in stock. They are 7×7 on 18 mesh and 14×14 on 13 mesh. The 7×7 canvas fits the 9×9 lacquer boxes from HP Designs. To see other designs by Sandra please see our website. Just in time for the Chinese New Year we are introducing a new designer – Ellen Solomons. Ellen’s designs have vibrant colors and are available on 13 mesh. 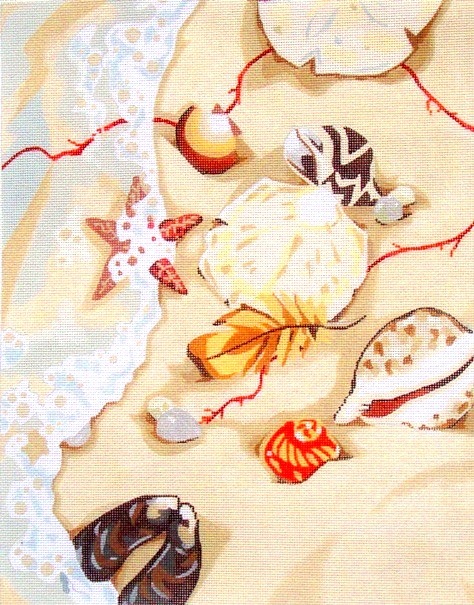 We released 2 new seascape designs by Sandra in Phoenix. 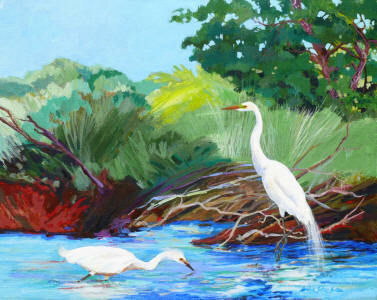 Two Egrets is 10×12.5 on 13 or 18 mesh. 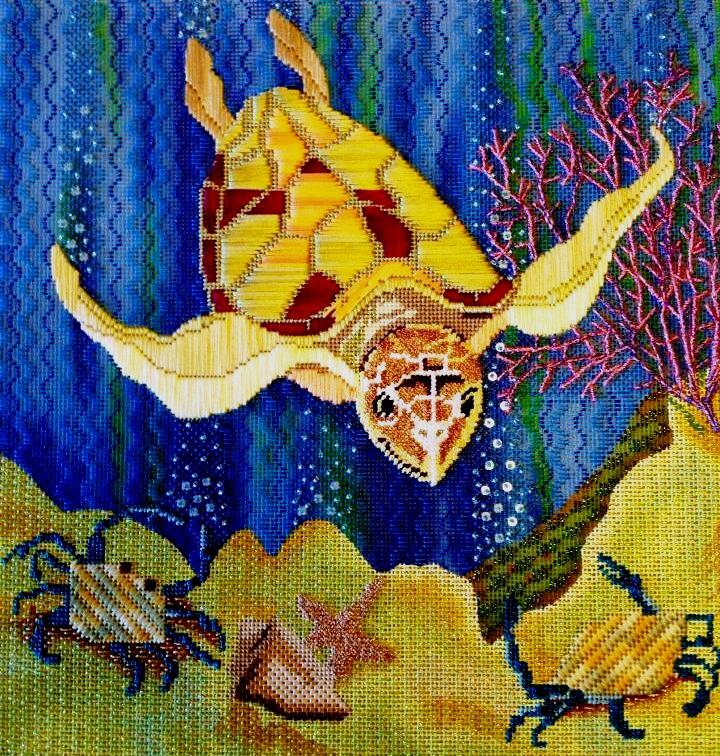 Caretta Caretta is 7×7 on 18 mesh or 14×14 on 13 mesh. We will be introducing 2 new designs by Donna Race at the Phoenix show. These are 10×14 and 14×10 on 18 mesh. 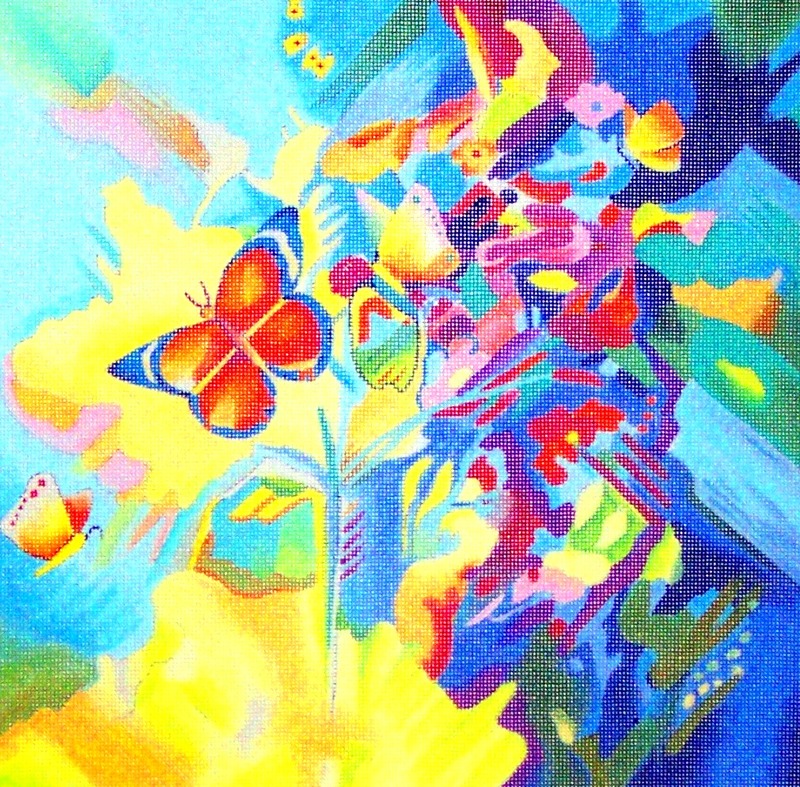 We just received 4 new designs from our painters. For a limited time, these are available at introductory prices! Crooked Tree sells through established needlepoint stores only.